^ a b c Lancaster, Kurt; Thomas J. Mikotowicz (2001). Performing the Force: Essays on Immersion Into Science-Fiction, Fantasy and Horror Environments. McFarland & Company. p. 61. ISBN 978-0-7864-0895-5. ^ "Awards for Spirits of the Air, Gremlins of the Clouds". Internet Movie Database. Retrieved 28 December 2007. ^ "Yubari International Fantastic Adventure Film Festival '90". yubarifanta.com. Archived from the original on 7 April 2004. Retrieved 19 September 2009. ^ Ascher-Walsh, Rebecca (13 May 1994). "How Crow Flew". Entertainment Weekly. Retrieved 28 December 2007. ^ "The Crow (1994)". Rotten Tomatoes. Archived from the original on 25 July 2008. Retrieved 28 December 2007. ^ "Awards for Dark City". Internet Movie Database. Retrieved 28 December 2007. ^ "Full Cast and Crew for I, Robot". Internet Movie Database. Retrieved 28 December 2007. ^ Fleming, Michael (10 December 2007). "Cage to star in Proyas' 'Knowing'". Variety. Retrieved 28 December 2007. ^ Sarafin, Jarrod. "Proyas Helms PARADISE LOST". Archived from the original on 18 September 2010. ^ Chitwood, Adam (6 July 2011). "Comic-Con 2011: Legendary Pictures Announces Panel Featuring PARADISE LOST". Retrieved 9 October 2012. ^ Fleming, Mike (9 February 2012). "Bradley Cooper-Starrer 'Paradise Lost' Scrapped By Legendary Pictures". Retrieved 9 October 2012. 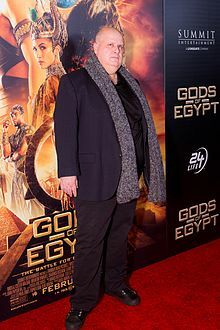 ^ "Alex Pyoyas' epic fantasy film project Gods of Egypt". geektyrant.com. Retrieved 17 June 2013. ^ "Awards for Alex Proyas". Internet Movie Database. Retrieved 28 December 2007.